Professional employer organizations (PEO) in Massachusetts will soon need to become registered in the state. This change was enacted on August 1, 2018, when House Bill 4732 was signed into law. The bill includes specific requirements that PEOs will need to comply with in order to get and stay registered. These include the requirement to obtain and maintain a surety bond, as well as the requirement to maintain a positive working capital. Read on to find out more about the registration requirements for PEOs in Massachusetts! According to House Bill 4732, a professional employer organization is a person or company that assumes all rights, duties, and obligations of an employer that arise out of an employment relationship. This includes employee management tasks such as payroll, employee benefits, workers’ compensation, training and development, and others, depending on the contract between the employer and the PEO. What are the requirements of HB 4732? Under HB4732, PEOs in Massachusetts will need to get registered with the Department of Labor Standards to be allowed to operate in the state. PEOs in the state are given 180 days as of August 1, 2018, to get registered at the Department in order to be compliant with the law. If a PEO is not registered in the state it cannot provide services to employees of clients who are based in Massachusetts, even if the PEOs clients are not based in the state. The organization can only provide services to such employees after becoming registered, though an interim permit may be issued by the Department until the registration is completed. Why do PEOs require surety bonds? 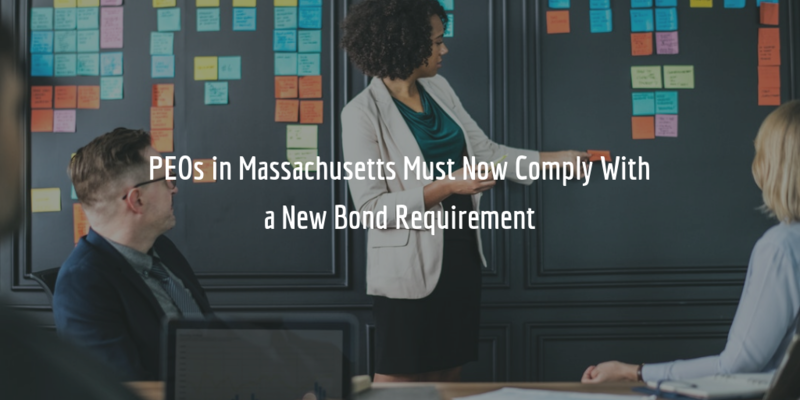 PEOs in Massachusetts require a surety bond as a form of guarantee to the state that they will comply with all the requirements of the laws that govern them. In particular, this is Chapter 149, Section 192 of the General Laws of Massachusetts. The bond further guarantees that PEOs will perform their duties and obligations under the agreement they have with their clients. If an organization fails to perform according to the conditions of their contract and thereby causes losses or damages to their client, the latter may file a claim against the PEO’s bond. In such a claim, the bond serves as a guarantee that claimants will be compensated in full for as much as the amount of the bond. What is the cost of PEO bonds in Massachusetts? The cost of a bond is determined by several factors, with the credit score of the bond applicant being the most important. The higher an applicant’s credit score, the lower the cost of their bond will be. Given the high amounts of these bonds, it is likely that the surety issuing the bond will also request to review further financial information about the applicant prior to providing a quote. Bond cost is determined on a case-by-case basis. To apply for a free quote on your Massachusetts PEO bond, complete our bond form, and we will get in touch with you shortly with your quote!